UDM Downloads > PMPro Video To Audio Extractor! PMPro VIdeo to Audio Extractor PMPro VIdeo to Audio Extractor is aextremely easy-to-use tool to extract audio from AVI, WMV, ASF, MPG, RM,Mp4,Mpeg4, QT,Mov, RMVB, VCD, SVCD and MPEG files to MP3, WAV, WMA and OGG format. It's very useful for those people who collect many music VIDEOs and want to save a sound segment from VIDEO for some reasons. supports converting a part of video file to audio file. 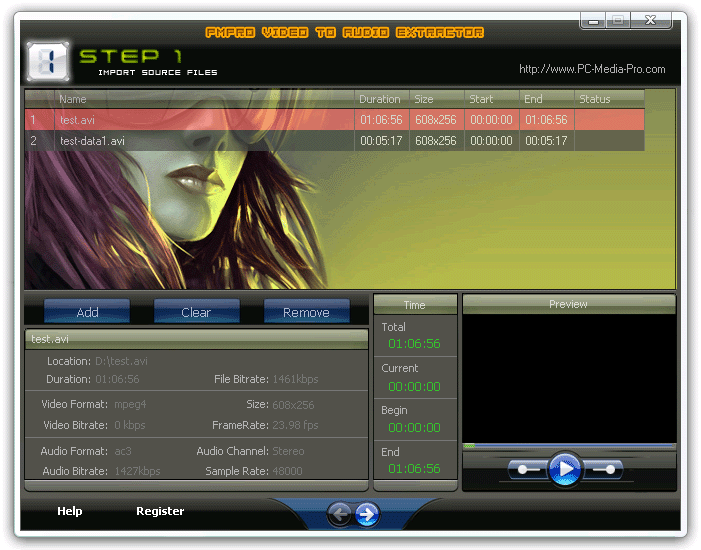 With a small video player built-in, you can set begin-time/end-time just when pre-listening the file. Converting in high precision and no quality is lost! You can extract audio from your video files to MP3s so you can listen them with your mp3 player. And you can also extract audio from video files to CD quality WAV files for burning your own audio CD (Assuming you have a CD-R). No quality is lost! Support fast batch conversion. Video to Audio Converter is with User-Friendly and Cool interface and extracting your audio files is just a button click away. Supported file format MPEG(mpg, mpeg, dat, vob); WMV; ASF; AVI; QuichTime(mov, qt); MPEG4(mp4); 3GP; DV(dv, dif) Features Cuts small part from a large auido file. Extract audio from AVI, WMV, ASF, MPEG,VCD,SVCD,RM, RMVB,MOV,Qt,3gp,Mp4 to MP3. Extract audio from AVI, WMV, ASF, MPEG,VCD,SVCD,RM, RMVB,MOV,Qt,3gp,Mp4 to WAV. Extract audio from AVI, WMV, ASF, MPEG,VCD,SVCD,RM, RMVB,MOV,Qt,3gp,Mp4 to WMA. Extract audio from AVI, WMV, ASF, MPEG,VCD,SVCD,RM, RMVB,MOV,Qt,3gp,Mp4 to OGG. Easy-to-use and fast batch conversion.